December is the time to look back, and if you have been doing a sprint of 365 days, now is the time to start to think about the retrospective. That is exactly what the MVP Selection Panel is doing right now. 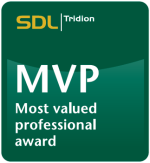 To select the new MVP’s for the SDL Tridion MVP Award program, we need to evaluate each nominee’s voluntary contribution to the SDL Tridion community over the past 12 months. Which is why I would like to mention, it is not too late. Well okay, in all fairness, if your plan is to become a 2014 SDL Tridion MVP, and up until now you haven’t written an single blog post or shared some of your ideas/code with the community, then it maybe is too late for you this year (although the evaluation goes for an entire year, and you could pull a rabbit out of your hat yet to surprise everybody, I challenge you). Just keep in mind, in a few weeks time it will be 2014, and from the 1st of January 2014 up until December 31st 2014, all your contributions will count for the year 2014, which if you play your cards right, could make you an SDL Tridion MVP in 2015. But of course you have been sharing (for years), and just maybe you are a tad worried it might not have been enough this year, then you still have 29 days in 2013. If you would, for example, write one blog post a day up until the end of this year, you will be in the top 3 of SDL Tridion bloggers (you won’t beat Alvin, but you have the option to become #2), and you will certainly be on the radar of the MVP Selection Panel and could still become a 2014 SDL Tridion MVP. Then please share your outcome, let’s make it an online community retrospective. Right after that, I would like you to have a look at your fellow community members. Are there some that have started or continued doing certain things which are on your own list? Maybe you should nominate them for an MVP award, by the way you can also nominate yourself, if you feel you have been a valuable contribution to the SDL Tridion community. Just make sure your nominations are received before December 31st, 2013. This entry was posted in Community, Tridion news by Bart. Bookmark the permalink.